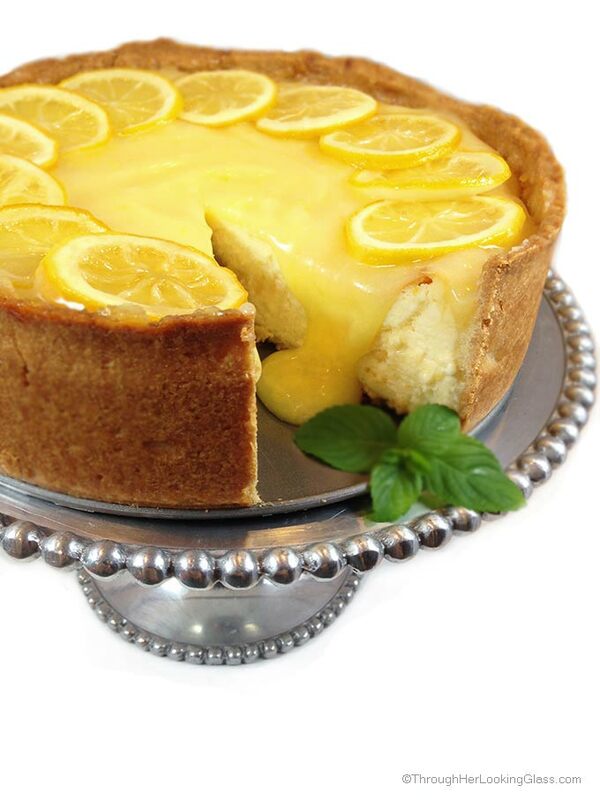 Today I’m very excited to be sharing a delightful Lemon Cream recipe that will enhance your spring and summer desserts and cakes. Think cake filling. Dollop it on ice cream, pie or fruit. Hope you’re having a great week! The weather and temps have fluctuated around here like crazy. First it was freezing, then yesterday it was 70°. I’m not complaining. It was so beautiful out and I even got in a great power walk. The sky was a brilliant blue, and there are no leaves on the trees yet. I dodged mud, puddles and even some ice patches. It’s all part of the adventure we call “spring” in New England. The gorgeous weather got me thinking about spring and summer. And summer desserts. If you happen to love lemon curd and whipping cream like I do, then you’ll love this creamy dreamy, lemony filling that’s perfect for spring and summer. Lemon Cream has the light and creamy consistency of whipped cream. But also the distinctly sweet tart pucker of lemon curd. Delicious and addictive. This combination definitely takes lemon curd to the next level. It’s made from all “real” ingredients. And a bonus: it just happens to be gluten free! 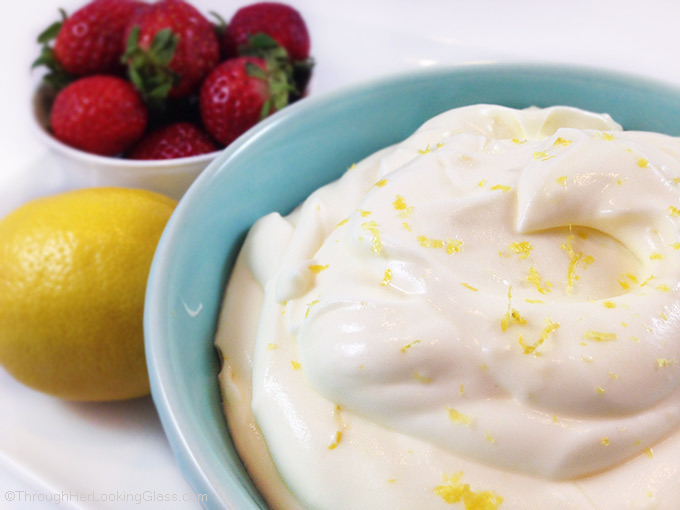 Lemon Cream with lemon curd has just two ingredients: lemon curd and whipping cream. 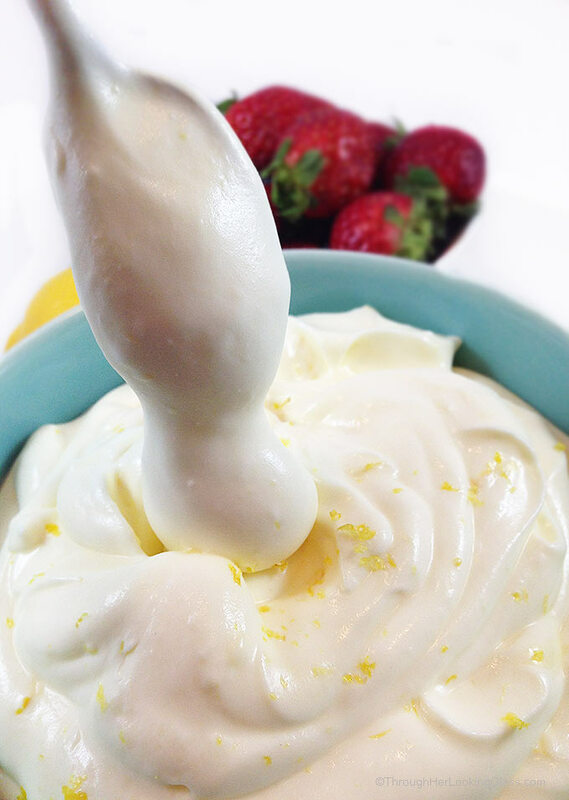 Whip the heavy whipping cream until soft peaks form, then gently fold in the lemon curd. Add lemon zest if you like. So many ways to use this delicious Lemon Cream. As a filling between cake layers. Dolloped on fresh berries. In a parfait. As a pie filling. In cream puffs. On top of angel food cake. As a crepe filling. A tart filling. Seriously, the possibilities are endless and I’m sure you’ll think of lots of ways I haven’t. 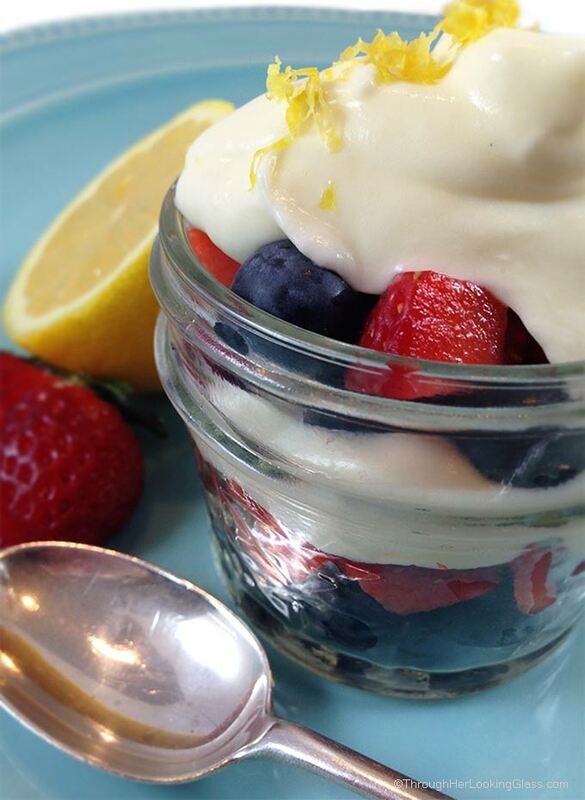 Keep your eyes peeled, I’ll definitely be sharing more recipes using Lemon Cream with lemon curd in the coming days. 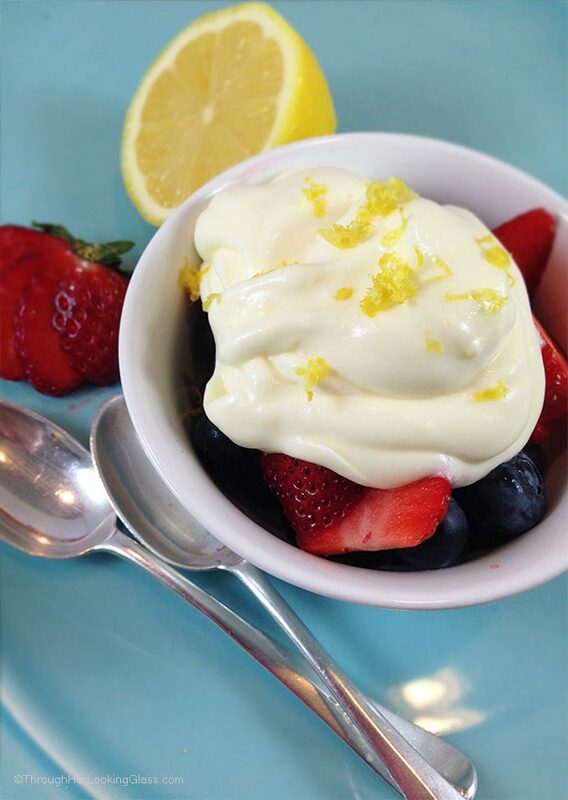 Lemon Cream with Lemon Curd is a delightful lemon filling with whipped cream. Sweet and tart. Creamy and delicious. This takes lemon curd to the next level! Chill medium sized mixing bowl for a few minutes. Pour heavy whipping cream into a cold mixing bowl. On high speed, whip heavy whipping cream until soft peaks form. Gently fold in lemon curd (and lemon zest if using) until it is incorporated throughout. Use immediately in your favorite dessert. This lemon cream looks so refreshingly yummy dear Allie. It sure would enhance spring desserts. But this is just so good, that I can have this without anything! Absolutely lovely share dear! Have a lovely weekend! I have a weakness for anything lemon!! this look so yummy! I will be trying all your lemon recipes for sure, my friend! My son is obsessed with all things lemon, this is perfect for him--I have to make it ASAP! This sounds wonderful! Perfect topping for fresh berries! I decided to try my hand at lemon curd this weekend, so this is perfect timing!! Looks sooo good-can't wait to try it! Oh.my.goodness. I am drooling over this and it could be dangerous, as I would sit and eat this right out of the bowl. Yikes. This looks so delicious and simple to make. I know I would enjoy this in a parfait, with angel food cake, or by just scooping it up right out of the bowl I mixed it in! I love lemon and use it all the time in my recipes. I love all things lemon. This looks delicious! I can't wait to try this. I use this mixture to fill a delicious lemon cake, I just stabilize with gelatine to be sure it stays inside the cake. It is one of my favorite and most requested fillings!!! This looks so delectable and easy to make. I know I would appreciate this in a parfait, with heavenly attendant nourishment cake, or by simply scooping it up right out of the dish I blended it in! I adore lemon and use it all the time in my formulas. It looks delicious! I'm going to try it out! How long does the lemon cream last? 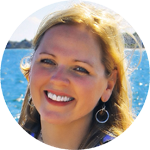 Hi Aridesme - so nice to hear from you, thanks for dropping by. I usually make the lemon cream right before serving and rarely have leftovers, so I'm not sure. I'm guessing it would last a day of two. The lemon cream really has a sweet, puckery flavor and I hope you get a chance to try. I especially love this sandwiched in cream puffs. So delicious!!! Could this be used for a cookie filling? Do you think it would spread a lot if baked ? Hi Mia - Thanks for dropping by. 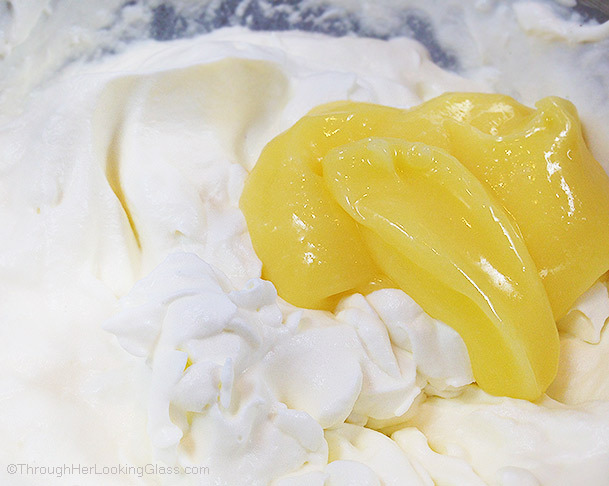 I definitely think this would melt if you baked it, because it's basically a lemon curd flavored whipped cream. You might have better luck filling the cookies with straight lemon curd, but even then, I might add it after they were baked. Here's my recipe for the lemon curd: https://www.throughherlookingglass.com/easy-classic-lemon-curd/ I guess it depends what kind of cookies you are filling. But I was thinking a thumbprint type cookie with the lemon curd filling in the middle would be very yummy! Is it possible to use this cream for cupcakes? Hi Asel - do you mean as frosting or as a filling? I don't think this would hold up (be stiff enough) as a frosting, but it would make a great filling. I'm actually thinking of making a trifle with this lemon cream soon. Happy baking!